The German anti-tank gun is moved to its firing position on opening days. Since 1943, there has been a German bunker on the northern pier in Hoek van Holland (Hook of Holland). This type 611 bunker, designed to station a field gun, was part of the infamous ‘Atlantikwall’ (Atlantic Wall) during the Second World War. In recent years, this bunker has been refurbished and has become the new visitor centre through the labour of a determined crew of volunteers. In the museum you will experience the story of the Atlantikwall through original artefacts, audio and video, dioramas and text panels. 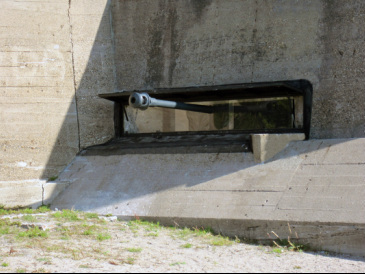 There are also frequent guided tours through the former German anti-aircraft battery known as ‘Nordmole’. Click here to learn more about guided tours. The museum is a centre for knowledge and education about the Atlantikwall and aims to teach all its visitors, both young and old, about this part of history in a coherent fashion. It is important that this knowledge, which is ever less available from primary sources, is properly conveyed to the next generation. The museum is entirely run and maintained by volunteers. Would you like to support the museum by for example becoming a contributor or sponsor? Learn how you can support the museum, here. 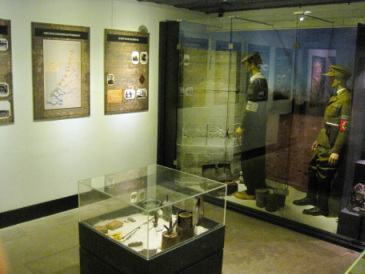 The former troop quarter is now an exposition room.